I have a successful career in Boston earning a six figure income in a “jack of all trades” type executive position. I use some technical skills, some budget and financial skills, some strategic visioning skills, and some project management skills where I am the liaison between software developers and end users. My situation is that my wife and I desperately want to move to the West Coast, preferably to San Francisco. We have visited San Francisco multiple times and we really love it. My company has a branch office there, but I get the feeling that our home office would never support me transferring there because they value what I am already doing in the Boston location. My wife and I don’t have a lot of connections on the West Coast and we don’t know how to do a long distance job search. I don’t see a lot of jobs advertised that would use the same skills that I have. It feels too financially risky to move there without a job. Do you have any suggestions for us? 1. The single easiest way to move to San Francisco would be for the branch office there to recruit you. It sounds like this isn’t going to happen unless someone with a significant amount of power there is willing to override the desire of the Boston staff to keep you where you are. So there is relationship building to do. Take any opportunity you have to attend conferences or trade shows with the San Francisco employees, to work on projects with them, and to interact with them any possible way (whether in person, via telephone, or via email). Recognize that each of these interactions is like a mini-interview. The more you can convince these people that their work lives would be better if you were working with them in San Francisco, the more likely someone will take a chance on ruffling the feathers of the Boston executives by inviting you to join the San Francisco team. 2. Your cover letter and resume should say you are relocating to San Francisco and your resume should have both a Boston address and a San Francisco address, along with a San Francisco phone number. 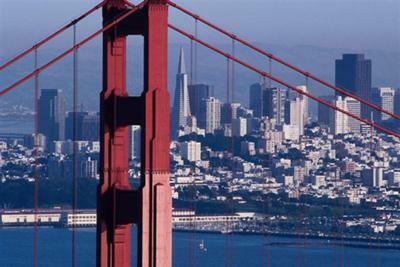 It is easy to get the San Francisco phone number by buying a number from a company like Kall8. You can forward this phone number to any phone you like. The reason that I recommend this strategy is that I believe San Francisco hiring managers and recruiters have an unconscious or conscious preference to hire people who are already committed to living in San Francisco rather than people who are merely considering San Francisco. 3. The reason long distance job searches can be tough is that companies prefer to hire local candidates who don’t need to be reimbursed for interview travel and who don’t need expensive relocation packages. If you really want to land a job in San Francisco, you have to make it easy for managers in San Francisco to meet you. This is a challenge since Boston and San Francisco are geographically far from each other, but look for opportunities to be in San Francisco so that you can say to decision-makers, “I am going to be in San Francisco February 1st through 4th and I could meet with you then.” (This dovetails with my recommendation in #1 to attend conferences near San Francisco and to work on projects with the San Francisco team…all your vacations for the next year could be in San Francisco, too!). As expensive as it can be to say this, you might also want to consider telling hiring managers, “If the expense of relocation is an issue for your budget, I am willing to pay for that myself since my wife and I are certain that we want to relocate to San Francisco.” If you do end up paying for this yourself, consult with a CPA to see whether it can be tax-deductible as there is a good chance that it will be. 4. It is much easier to land a job if your functional area of expertise is clear. As you have seen in your current position, companies love it when existing employees have “jack of all trades” abilities because this makes you an excellent employee. However, hiring managers don’t know what to do with generalists…they tend to want to hire specialists. So your resume needs to give the appearance of more clarity than it probably has right now. If you have a favorite area of functional expertise, start to shape your career focus to strengthen that one. Join the major professional association for this specific niche, attend the main national conference, create a LinkedIn profile that highlights mostly this one niche, and start to network with people who work in this functional area. Also look online for professionals who work in this niche and notice the groups of which they are members because you can join those same groups. If you aren’t sure which niches are in demand, use free web sites like Indeed.com and JobFox.com to review job ads to get a general feel for what types of positions are being advertised. Then create a resume that highlights your accomplishments around a specific focus rather than including everything that you have done. 5. Sometimes contacts who aren’t even in your same line of work turn out to be the best connections for landing a new job. Join your college’s alumni association and consider being more active in the group. It might be someone from that organization who introduces you to your next employer. Leverage any hobbies or sports activities you enjoy to deepen your relationships with other like-minded people who live in or near San Francisco. The key is to be someone who others like and trust so much that they will recommend you to colleagues and hiring managers.